Royal Sporting Club Anderlecht, commonly known as R.S.C Anderlecht, or simply Anderlecht, are the team Manchester United are going to face in the quarterfinals of the UEFA Europa League 2016-17. The first leg will be played at the Constant Vanden Stock Stadium in Brussels, Belgium on the 13th of April, with the return leg scheduled a week later at Old Trafford. Considering the fact that they are the only club among modern football’s European heavyweights to feature in the last eight of this year’s Europa League, Manchester United are the outright favourites to lift the elite trophy on the 24th of May at the Friends arena in Stockholm, Sweden. Also, since the Europa League winners are granted direct qualification to next year’s UEFA Champions League, the Red Devils need to take on each and every opponent they face now on in the Europa League with utmost seriousness, especially given their inconsistency in the Premier League. It would be foolish to underestimate Anderlecht, even for a club of the stature of Manchester United. 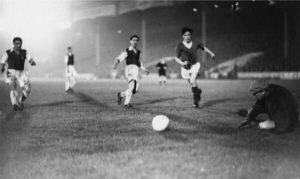 Yes, United thrashed Anderlecht 10-0, to record their biggest ever win in football in September 1956, but a repeat of the same scoreline is unlikely. Anderlecht are the most successful club in Belgium, with 33 titles in the Belgian Domestic League and five trophies in European competitions. Apart from holding the record for most number of consecutive Belgian League titles (they won five between the 1963-64 and 1967-68 seasons), they’ve also won nine Belgian Cup competitions. They are also ranked 13th amongst all-time UEFA club competition winners, just three places behind 10th-placed Manchester United, the most successful club in England and one of the most successful clubs in the modern era. Currently, they sit at the top of the table in the Belgian League with 61 points, two points ahead of rivals Club Brugge. They have won 18 of their 30 games, drawing 7 and losing 5(which is the least number of losses in the Belgian League) so far, and are on the way to qualify for next season’s Champions League. The last time Anderlecht faced Manchester United in the group stage of the Champions League in the 2000-01 season, they won 2-1. 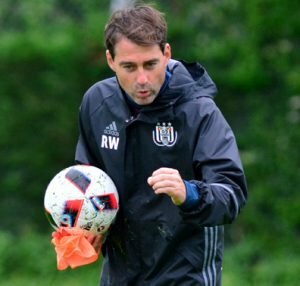 Under the stewardship of Rene Weiler , who was appointed at the start of this season, Anderlecht seem to have gotten back on song after losing out on the title in the last two seasons, to Club Brugge KV and KRC Genk. His tactics have been spot on, with a flexible 4-3-3 formation and players like Youri Tielemans and Lukasz Teodorczyk ensuring that the team doesn’t squander the opportunities of putting games to bed. 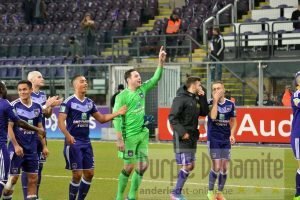 Anderlecht have historically troubled opposition teams in the final third, and Weiler’s tactics revolve around the same principle. The defenders are adept at defending and supporting the attack equally well. The defense has been solid, since they have conceded 30 goals in the Belgian League this season, just six more than Club Brugge, who’ve conceded the least number of goals(24). Wing-backs Dennis Appiah and Andy Najar provide ample attacking support in the final third for Anderlecht, alongwith centerback Kara Mbodji, who is known to trouble the opposition when it comes to set-pieces. Belgian duo Leander Dendoncker and Youri Tielemans are attracting lot of attention from big clubs all over Europe. The midfield is the greatest and most potent asset of Weiler’s Anderlecht. Holding midfielder Leander Dendoncker, who is now a regular first-team player, is one of their most critical players. The versatile 21-year old, who came through the club’s youth ranks, can slot in effectively at center back or in the center of midfield, and is renowed for his intelligence, positional awareness and ability to read the opposition’s passing lanes. Another key player for them is 19-year-old central midfielder Youri Tielemans. The teenage sensation has already caught the eye of the footballing fraternity, having scored 12 goals so far this season. His intelligence on and off the ball, range of passing with both feet, thunderous drive from range and work-rate in a box-to-box role are the reasons why he is touted to become one of the best central midfielders in the world in the next few years. They also have decent midfield options in Ivorian Idrissa Doumbia and Romanian Nicolae Stanciu. On the attacking front, Poland international Lukasz Teodorczyk has been prolific for Anderlecht this season. He is the Belgian League’s top scorer so far this season with 20 goals(0 from penalties), five more than the next best Jelle Vossen of Club Brugge(15). Apart from Teodorczyk, Anderlecht also have Ghana striker Frank Acheampong, who can give defenders nightmares with his blistering pace and strength. For those of you who thought going through the quarter-finals of the Europa League would be a cakewalk for Manchester United this season, think again. Anderlecht aren’t some mid-table team. They have quality in their squad and flexibility in their tactics, and are among the best in their country. All in all, this one should be an exciting to tie watch for football fans around the world.